The El Centro Colibri Wellness series is hosting "Art is Revolutionary." 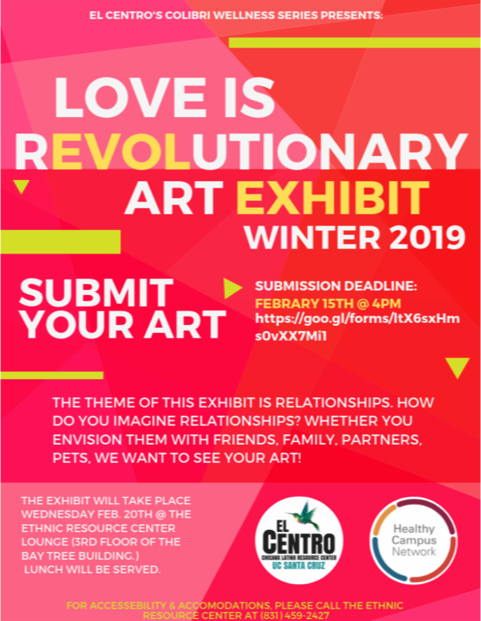 The art exhibit this quarter is calling for LATINX ARTIST to submit around the theme of relationships. How do you imagine friendships? Whether you envision them with friends, family, partners, etc. This exhibit will take place Wednesday, February 20th from 11am-1pm at the ERC lounge. All artwork will be professionally printed and displayed.